FUSION STEM: The Core, Science Central, Bath Lane, Newcastle, NE4 5TF. 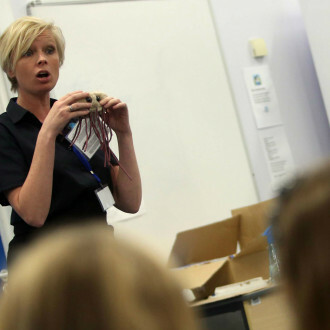 Could you help us to make STEM exciting, entertaining, educational and fun? Are you a natural communicator who loves to share your passion for Science, Technology, Engineering and Maths (STEM) with others? If so, we’d love to hear from you. We are recruiting a STEM Communicator to join our team – to help inspire the next generation of STEM professionals by delivering an imaginative programme of bespoke activities. Read on for more information about the job description and how to apply. Feel free to share with anyone you feel would suit our friendly team! FUSION is a communication and consultancy company which aims to connect the world with Science, Technology, Engineering and Maths (STEM). We do this through events and activities which deliver high quality STEM experiences for all participants. One of these activities is ‘Kablooey Clubs,’ our After School STEM Clubs which aim to inspire pupils in STEM subjects through an imaginative programme of bespoke activities delivered directly to North East schools. Responsible to: Claire Willis, Director of Fusion STEM Ltd. Important Internal Relationships: All those employed within Fusion STEM Ltd. Important External Relationships: All Clients of Fusion STEM, educators and pupils, local businesses, partner organisations, funders, suppliers and wider networks. The post holder will report to the Director but work with the Club Coordinator to deliver all aspects of formal and informal STEM communication to educational, public and wider audiences. The work will include delivery at schools and other locations across the North East usually after school, at weekends and during holiday periods. The most important part of the job will be to make STEM exciting, entertaining, educational and fun. To deliver engaging educational experiences within the field of STEM through practical demonstrations, workshops and associated activities. Delivering activities at festivals often in wide-ranging locations. vi) To undertake risk assessments for all STEM activities prior to their delivery vii) To undertake any other reasonable duties commensurate with the position as requested by the Director, Clubs Coordinator or teacher responsible. The post-holder will be employed on a zero hours contract. Working hours are subject to operational needs and may vary either on a temporary or a continuing basis. You may be required to attend up to five clubs per week for one hour sessions, travel time and set-up time are also included. The post-holder will be employed on a rate of £8 per hour. Travel expenses to schools and locations other than to the company registered office will be paid at 45p per mile. Connecting the World with STEM.